Light sticks emit a variety of bright colors. The vibrant glow of a breaking wave at midnight, the mysterious Morse code of firefly flashes, and the macabre fascination of the glitter of deep ocean fish all owe their magic to a straightforward, and unexpectedly useful, set of chemical reactions. Chemoluminescence is the term for light that’s emitted as a product of chemical reactions. Chemiluminescent reactions produce unstable products, which then decay in order to form more stable products. In the process, energy is emitted in the form of light. One of the earliest observed examples of chemoluminescence was the emission of a greenish glow when elemental phosphorus was exposed to damp air. Phosphorus vapor absorbed into the air around the solid is oxidized, producing HPO and (PO)2 in their excited states. Green light is emitted as the molecules return to their stable, lower energy states. 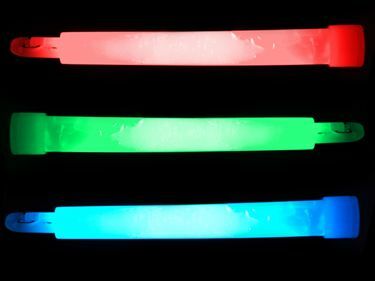 Light sticks (also known as glow sticks) utilize chemoluminescence, and are used by everyone from emergency workers and military personnel to rave dancers and Halloween trick-or-treaters. While they do not provide bright illumination, they are perfect for highlighting someone’s position in the dark. They are particularly useful in situations (such as the aftermath of an earthquake or nighttime scuba diving) where it is dangerous or impractical to use electricity. The sticks are turned on by “snapping” the central separator to mix two sets of chemicals. 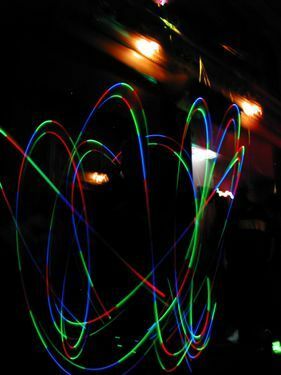 The reaction emits light in a variety of bright colors. A typical light stick contains hydrogen peroxide (H2O2) and Cyalume, a phenyl oxalate ester. These are kept separate until the stick is snapped. A fluorescent dye glows when excited by energy from this chemical reaction. Peroxides are ideal reactants for chemoluminescence, since the bond between the two oxygen atoms is easily cleaved, and releases a significant quantity of energy when broken. The color of light emitted depends purely on the dye used. The energy released during this decomposition excites the dye, which fluoresces to emit colored light. Chemoluminescence has a number of important applications. A dramatic example is the use of luminol in forensics. Luminol reacts with tiny amounts of iron to generate luminescence. Detectives use this property at crime scenes, by spraying luminol on surfaces to detect the presence of blood, which is rich in iron. Chemoluminescence spectroscopy is an important tool in chemical analysis. The emissions from excited molecules, either in the gas phase or in solution, are measured using a photomultiplier or similar light-sensitive instrument, possibly in combination with a chromatograph. Measurement of the light emitted through chemoluminescence is used to determine the concentration of the excited chemical reagent. The efficiency with which light is emitted during luminescence is an important measure associated with chemoluminescence and bioluminescence. This number reveals the fraction of the energy used in the reaction that is emitted as light. As an example, compared to an incandescent bulb that is 10% efficient in transferring input energy to light, a firefly has an astonishing efficiency of 88%.